You know that the key to de-cluttering your home is to organize everything, but what about the things that don’t fit into a simple category? It’s easy to let them sit around as clutter, but fight the urge. Designate a place for everything. Clearly label boxes, including the names of objects that don’t really fit into that category well. For example, if you lack an “Outdoors” box but have a pair of binoculars you want to hang onto, you might put them in your “Entertainment” box and add “binoculars” to the label so you can find them later. Also, Follow the “OHIO” principle: “Only Handle It Once”. When cleaning, don’t pick something up, try to figure out where it goes, and give up and set it down. Rather, make a decision about where to put it right now. The more often you use it, the more accessible it should be. This will prevent you from getting frustrated with your new organization system, because you won’t have to struggle to retrieve things you use on a daily basis, while you won’t be tripping over things you only use once a year. It can be hard to decide whether you should hold onto something or not. If it has little sentimental, or monetary value and you haven’t used it in years, donate it. 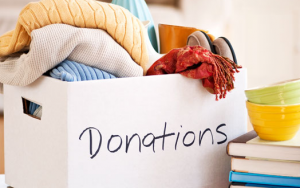 If it has some sentimental value but is very large, or you have too many large sentimental items, consider donating it. Your grandmother’s treasured vase is worth keeping; your ex’s golf clubs aren’t. Decide what is and isn’t junk, while also making a decision about how much you can safely store. Do a little each day, and re-clean what you’ve already done. When your house is buried in clutter, it’s easy to get discouraged when you’ve already spent a lot of time de-cluttering but realize your house still looks like a wreck. It’s easy to let the clutter creep back into clean spaces. Don’t! It’s much easier to maintain than to start over. While it is cheaper to keep your house clean yourself, some people opt to hire. It can be a great incentive to keep your life clutter-free. Some companies offer a Free Estimate; you may find it’s not as expensive as you think. These tips can help you get on your way to having a beautiful, well-cared-for home you can take pride in and won’t be embarrassed to show guests.